Or see [http://yabb.jriver.com/interact/index.php?topic=50164.msg343486#msg343486 this thread] on Interact. * Skin. Select the skin to be used in Theater View. * '''Skin''': Select the skin to be used in Theater View. This is where you can select a touchscreen skin, making Theater View compatible with your touchscreen computer. * Size. 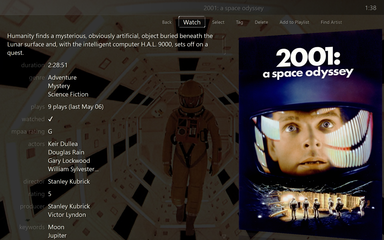 Select the size of the Theater View lists and icons. The default is "Normal". * Show Thumbnail Captions. This is on by default. Disable it if you do not want any text appearing under the thumbnails. * '''Size''': Select the size of the Theater View lists and icons. The default is "100%". *'''Drawing Quality''': Default is "Medium Quality"
* Allow navigation with left and right arrows. This is disabled by default. This refers to the ability to move between screens using the arrow keys. The arrow keys can always be used to navigate within a page; but no navigate to other pages, this option must be enabled. * Jump on play: None, Playing Now or Full Screen. This determines what Theater View displays when you play something. If you tend to watch video or images, you may want to set it to Full Screen. * Show when playback stops. Disabled by default. Enable this if you always want to display Theater View when playback stops while in Full Screen Mode. * Keep focus (recommended). This keeps the Theater Mode window on top at all times. To go to Standard View, right-click and select Standard View. * '''Jump on play: None, Playing Now or Full Screen''': This determines what Theater View displays when you play something. If you tend to watch video or images, you may want to set it to Full Screen. * Play sound. 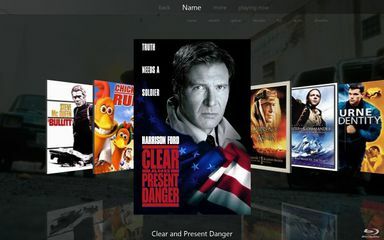 When enabled, Media Center plays a sound when Theater View menu items are selected. 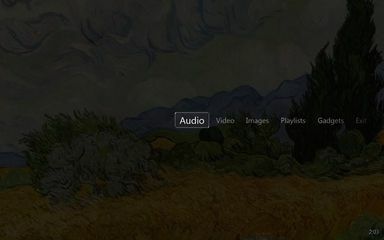 * '''Play sound''': When enabled, Media Center plays a sound when Theater View menu items are selected. * Arrows. The four arrows are used for navigating the elements presented by theater view. * Enter. Selects an item which is highlighted to expand its properties. * Esc. Starts the exit process from theater view. Users must then select Yes to confirm exiting. 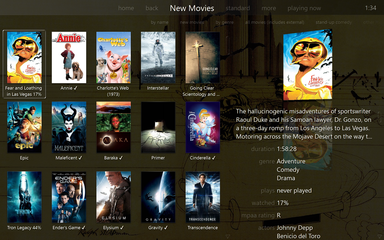 There are the menu items displayed in the Theater View Home Page. You can Edit, Remove and Sort them, or you can Add custom items (other programs or webpages). # Click Add, and select Custom Item. # Right-click on the View Scheme and select Edit View Scheme. # Uncheck Show in Theater View.